My kids love drawing with chalk – we had a blackboard for a while, although the chalk dust drove me crazy, so we moved the chalk masterpieces to the concrete outside. 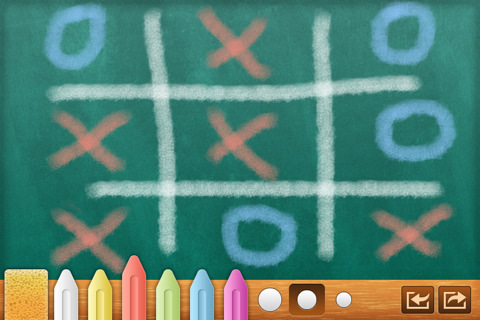 Here’s a superb new iPad and iPhone app that reinvents the blackboard – minus the chalk dust. Bord is a beautifully designed chalkboard for the iPad or iPhone. The graphics are incredibly realistic (with no fear of scratching fingernails on the blackboard!) and kids can exercise their artistic talents using six colours and three thicknesses of chalk. There is a sponge to clean the board (leaving realistic chalk traces) and drawings can be saved and shared via email and Facebook. I like the fact that you can draw with ten fingers all at once – might be a little tricky on your phone but the iPad ‘canvas’ is perfect. Bord is $1.19 and is available in the iTunes App Store. Check out other apps here.